Automatic chronograph movement, personalised to U-BOAT specifications, with decorations, date display and stem position at 9 o’clock. 925 silver rotor modified to U-BOAT specifications, with black rhodium-plating and blue screws. Frequency: 28,800 vibrations per hour, 4 Hz. Power reserve: 48 hours. 25 jewels. 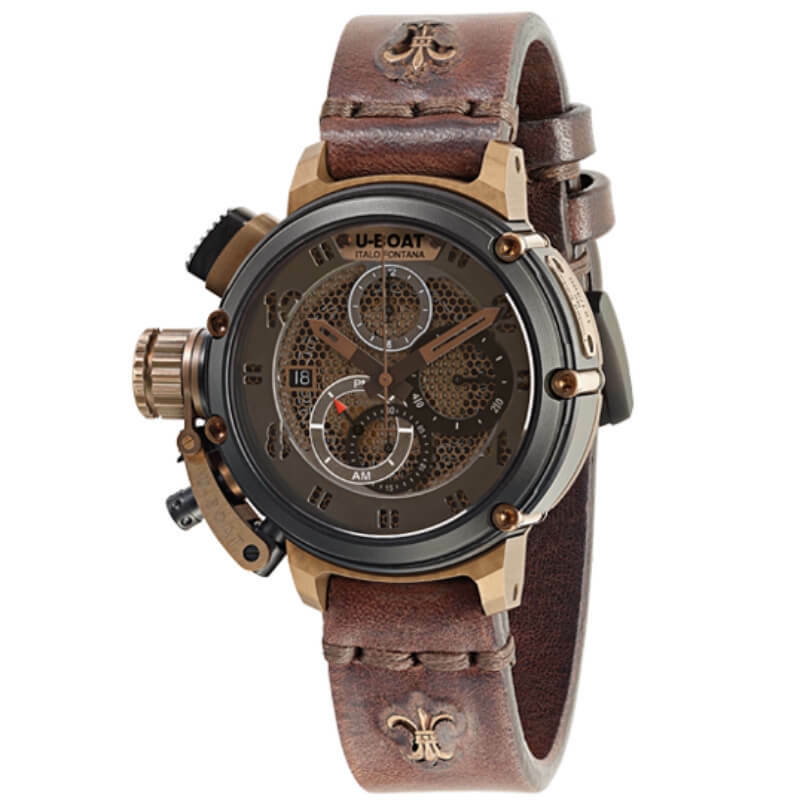 46 mm diameter, made of naturally aged bronze with case, bezel, chrono pushers, lever hook pin, serial number plate screws and strap bar fixing screws made of AISI 316L steel with PVD coating. Skeleton dial on four superimposed levels with the last layer made of laser cut fine stainless steel wire mesh, partially revealing the movement. Laser cut hour and minute hands, hands brushed on the surface, hands painted central joint. Hands-brushed, bronze colour counter hands and seconds. Red colour 24h indicator hand. Fumé sapphire glass, curved on the face, anti reflective treatment and flat on the back of the timepiece, double gasket sealing. Handmade from hand-finished calf leather, carefully selected and processed according to the traditional artisan techniques used in the 1800s, giving the strap a naturally distressed look and feel. Steel tongue buckle with matt black PVD coating. Width: 20/22 mm. Bronze fleur-de-lis insert.